Do not front on your friends. Men come and tend to go—true girlfriends stay true for the long haul. So when you find a new man, don't front on your girlfriends who were riding with you through the ups and downs of single life. If you make plans to go out with your girls, don't break them just because your new boo calls you up for a date at the last minute. Care about your appearance. Not for others' sake, but for YOURSELF. How you present yourself to the universe does have an effect on how you feel about yourself. Hold your head high and strut! Educate yourself. A truly classy black lady is knowledgeable on a variety of subjects and aware of recent news. Read a non-fiction or "how to" book that will teach you something new regularly. Visit informational websites and read articles written by experts. Mix some CNN into your TV schedule along with your reality shows. Do not play "Capn save em" with every man you meet. This has been one of my own personal vices in the past. While it's always best to be a sister and support to the men in your life, you are not personally responsible for the success of a grown man. If he messes up, that's his fault and his problem to resolve—not yours. Allow a man to be a man and figure things out on his own—nine times out of 10 that's exactly what he'll do. Avoid being loud and rowdy in public. I don't care how mad you get while you're out and about. A classy black lady does not get loud, violent, or ghetto in public. If you're having a disagreement with a friend while out in public, you pull the person aside to a private place before stating your piece. Get your "houses" in order. How can you call yourself a classy black lady if your home is a mess? Don't be "nice nasty." Your home is your castle—make sure that you keep it clean, tidy, and well organized. This commandment also applies to your personal "house" meaning your body (tying into #2). Treat it like a temple—eat healthy, exercise and stay fit, and protect yourself when being intimate. Take care of your teeth, hair, and skin. As Jim Rohn said, "Take care of your body. It's the only place you have to live." Don't let money control you, you control the money. Love of money (greed) is the root of all evil. Buying expensive material items is not going to fulfill your life—let's get that straight off the bat. However, if you choose to spend money do it in a way that keeps you in complete control of your finances. Save for your future. A smart and classy black lady knows the importance of saving money toward her future. Forget all those bogus and suspect reports about the net wealth of black women—you know your own situation and you know what you have to do to save for your future. Put money away in a safe place, like a CD or IRA account. Experience and respect different cultures. As a classy black lady don't hesitate to expand your mind by experiencing and showing respect to other cultures. Travel and visit new places. Don't be afraid to make friends with people from different cultures or even date outside of your circle. Try new foods and activities that you wouldn't normally partake in. Cultural awareness is an important step to becoming a complete and well-rounded lady. Love and appreciate your black sisters. Take a serious look around at your mothers, your sisters, your aunties, your sorority sisters, and your friends. Look at how they sacrifice for you and the other people in your life. Love and appreciate other black women for their strength, caring hearts, and beauty. We are a resilient group of women who despite being beaten down continue to rise up. Learn from the black women around you and continue to strive for excellence in your own life. If you think I missed an important commandment that every classy black lady should follow, let me know in the comments area below! To grow black hair long you have to modify your daily habits. The process of growing afro hair is 90% about your method and 10% about the shampoos and conditioners you buy. As black ladies, we spend hundreds buying up pricey beauty products simply because some stranger on the Internet said it was the secret to grow black hair long. But here's the truth: the products you choose matter only a little. It's the way you treat your hair that matters the most if you want to grow black hair long. This article is the REAL DEAL. No need to buy books or scour the various websites for different methods. Just try this step by step process for growing black hair past the shoulders to the tee for at least two months. Then come back to this blog and let me know your results. Listen, as I said earlier the products matter only a little. You can use what you want as long as it's a comparable quality product to what I've suggested above. As you can see I have a personal preference for Chi and Keracare products but you can use any you'd like to grow black hair long. 2. Do you know why some black women's hair breaks off around the shoulders? What about why some black ladies can't seem to grow black hair long despite substantial new growth between relaxers. It's because strands of black hair are more delicate (especially when relaxed) It's also because we let our hair rub up against the harsh fabrics we wear. The reasons why it's sometimes hard to grow black hair long are pretty simple and logical. Read more about how the clothes we wear affects our hair here. 3. Wash black hair every 4 to 5 days to grow black hair long. There are no exceptions to this rule, you must wash your hair. Lather your hair while standing in the shower and make sure you do it the right way: 1) push all of your hair down straight to the back when you're washing 2) run your fingertips through your hair to remove all the buildup on your scalp 3) rinse and repeat the shampoo once or twice but don't overdo it 4) don't rub black hair all over your head like you see in the movies. The way you wash your hair is key to learning how to grow black hair long. 4. Proper Hair Conditioning is necessary to grow black hair long. Put your conditioner in going backwards. Then use a wide tooth comb to slowly detangle your hair. Take your time with your hair--use your fingertips to untangle the strands. Do not under any circumstance "rip" any comb or brush through your hair! Careful combing and detangling is extremely important if you want to grow black hair long. After you're finished, go back over your hair with a thin toothed comb this time. Again, do this slowly, carefully and gently from the root on down until your hair is completely detangled. Leave the conditioner on for at least 5 minutes before rinsing it out. 5. Deep conditioning is necessary to grow black hair long. Deep condition every 3 weeks when you wash. Same process as described in the previous step for conditioning except use the deep conditioning product of your choice, put on a heat cap, wrap everything up with a towel, then leave it on for a half hour before rinsing and moving onto the next step. 6. Use a paper towel to squeeze the excess moisture from your hair after washing. Avoid using a standard bath towel if your goal is to grow black hair long! Cotton bath towels are harsh on your hair. 7. Put some leave in conditioner in your hair after washing. Apply leave in conditioner--don't go overboard because you don't want to weigh down your hair--you want it light and fluffy. After that, add about a dime's worth of Chi Silk Infusion to your wet hair. The Silk Infusion helps keep your hair smooth, supple and shiny between washes and also helps you reach your main goal: to grow black hair long. 8. Roller set your hair. You can either let it air dry this way or sit under a bonnet dryer. Once your hair is completely dry, spray it with a thermal protector like Chi Ironguard (look to the left, to the left). The Iron Guard shields your hair from the intense heat of the blow dryer, curling iron, or flat iron. You need a thermal protector to help keep your strands in tact so that you can grow black hair long. 9. Flat iron your hair (optional). After blow drying out your roots, the ceramic flat iron will help straighten your hair to a silky shine. You may be pleasantly surprised at the results when you follow these steps to the tee. You can also add a light setting lotion when wet, braid your hair, and let your black hair dry curly as an alternative to the straight look. There's a Dominican hair product called Konzil (leave in lotion) that I've heard might help you get a better curly look. Remember: the less heat the better when you want to grow black hair long. 10. Spritz your hair with Keracare Oil Sheen spray (or a similar oil sheen spray for black hair) once in a while to keep it shiny and healthy. Keracare's version has a "humidity block" formula that's helpful when you're out in the hot sun. 11. 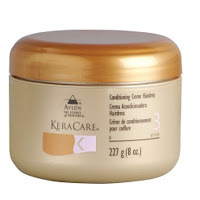 Put Keracare conditioning crème hairdress on your hair ends and through your scalp every night. Not too much--just a dab on your finger. Afterwards, wrap your hair with a satin scarf before you go to sleep—wearing a satin scarf is required if you want to grow black hair long. 12. Wear protective styles (such as buns and butterfly hair clips) when your hair is in between washes. Don't allow black hair to brush on your shoulders for long periods of time. Let your hair down when you're going out for a hot date. When at home or just running around town put the hair up in a cute protective style. This simple habit will help you grow black hair long. Relax your hair three or four times a year. That's right, let it stretch for as long as possible. I personally like Optimum's relaxer because it has a breakage defense packet that you can put on your hair before applying the cream to new growth. Consider buying more shirts made of satin or a satin robe to wear at home if you want your hair to hang down. Did I say that you must wash your hair every 4 to 5 days to grow black hair long ? Regardless, it's worth repeating a thousand times over! Do not go a week or more without washing your hair--leaving dirt and oils in your hair does not promote black hair growth. Forget what your ma, auntie or hair stylist told you in the past --do not apply heavy oils or grease to your hair if you want to grow black hair long. PERIOD. End of story.